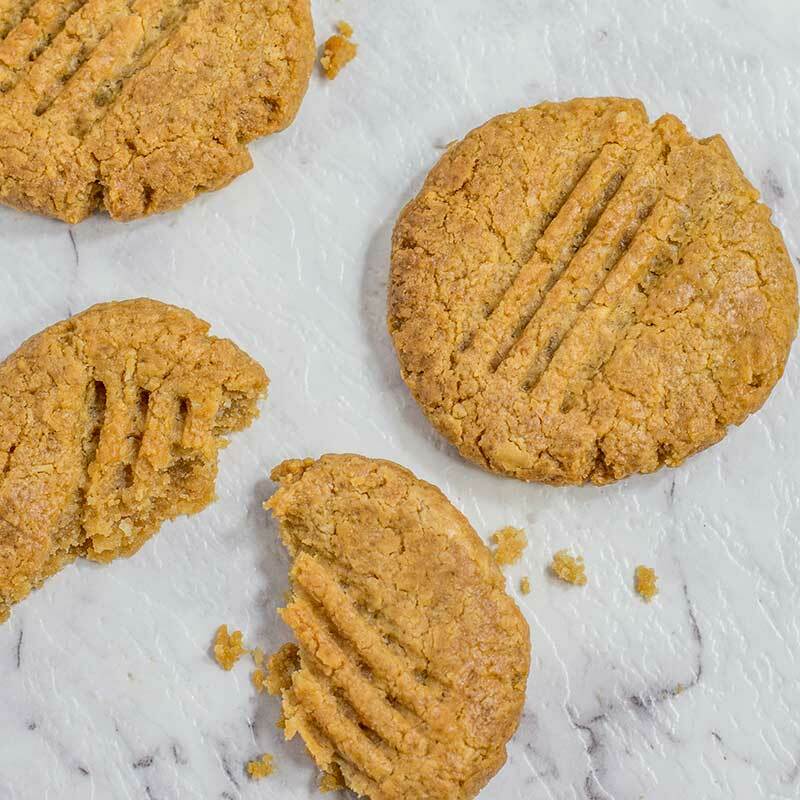 Our Keto Peanut Butter Cookies recipe will you have you happily snacking in no time. This is a quick recipe that everyone loves! 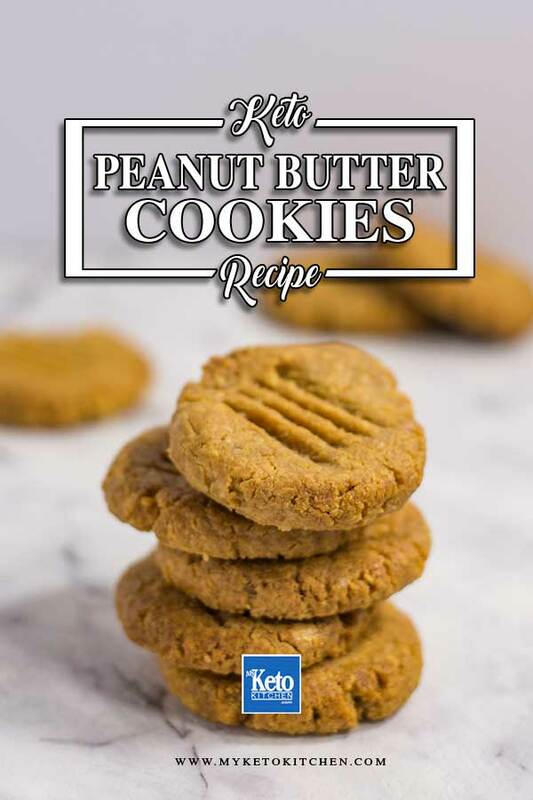 Not only are these keto peanut butter cookies low carb and easy to make the ingredients are all natural. If you have been living sugar-free for some time, you may find these cookies to be a little sweet. 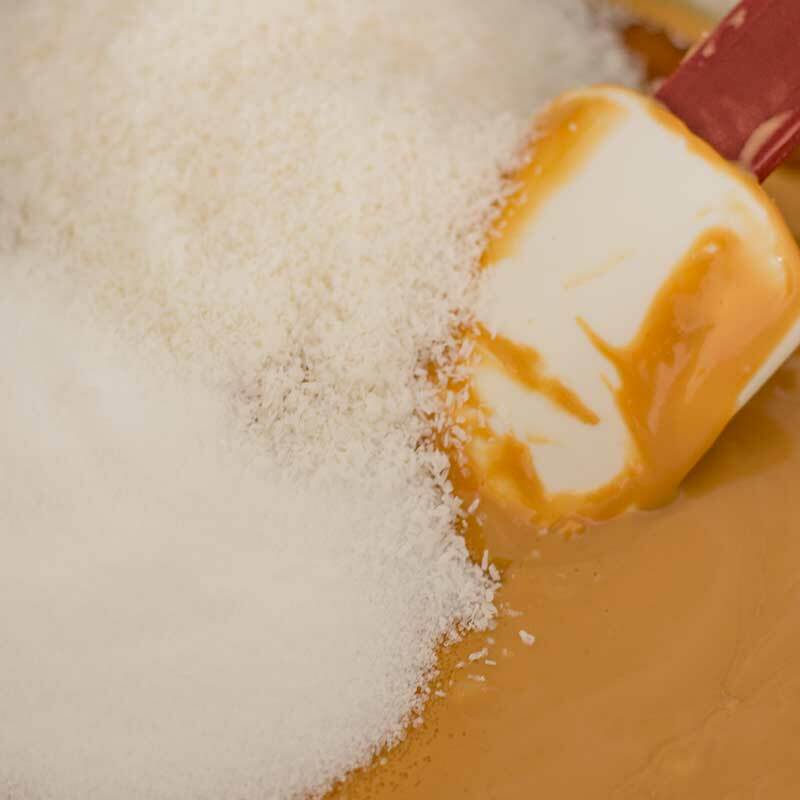 Reduce the sweetener to 1/3 cup if your sweet tooth is not what it once was. This keto cookies recipe makes approximately 20 cookies. 1 serving is 1 cookie. Once the cookies are completely cooled, they can be stored on the counter in an airtight container for up to 1 week. Preheat your oven to 160C/320F. Line a cookie sheet with parchment paper and set aside. In a mixing bowl, add all ingredients and mix together. Be sure to mix all the ingredients thoroughly. Roll the mixture into heaped tablespoon-sized balls and press onto your cookie sheet. These cookies do not spread at all so be sure to shape them into your desired size before baking and press with a fork or your fingers to create crunchy ridges. The ridgier (if that’s a word), the better. Bake in the oven for 12-18 minutes or until the tops of the cookies are browning, and the edges are beginning to harden. They will firm up when cooling but become very dry and sandy if overcooked so be careful. Leave cookies to cool completely before enjoying. 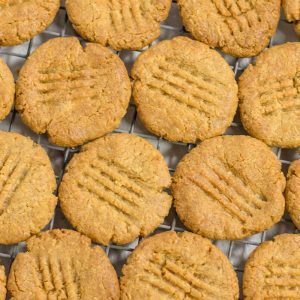 #1 Keto Peanut Butter Cookies Recipe - "Crunchy & Delicious" - Easy to Make! Roll the mixture into heaped tablespoon-sized balls and press onto your cookie sheet. These cookies do not spread at all so be sure to shape them into your desired size before baking and press with a fork or your fingers to create crunchy ridges. The ridgier (if that's a word), the better. 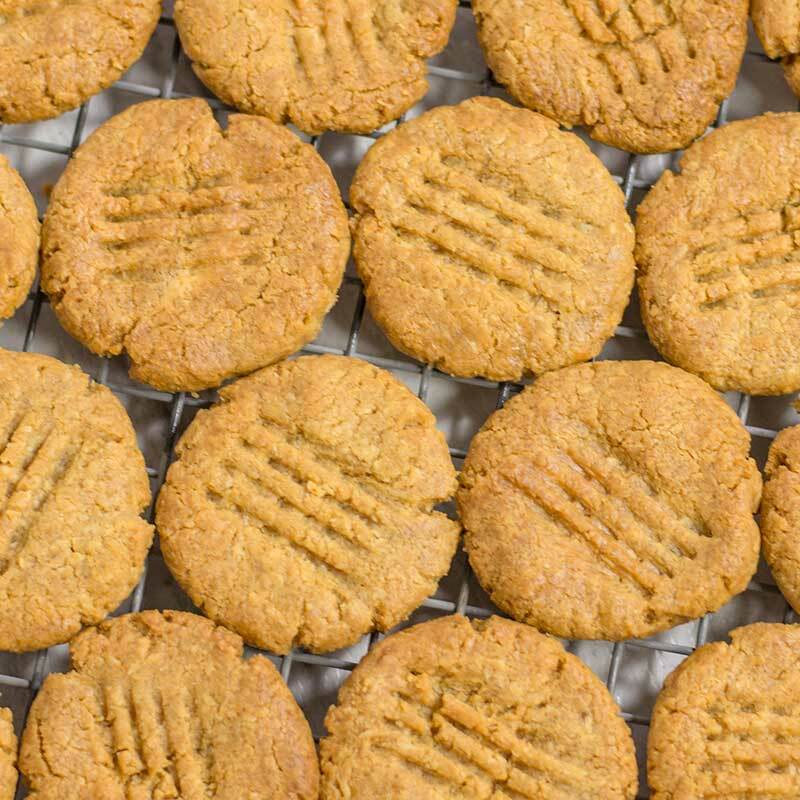 To make a larger batch of our Keto Peanut Butter Cookies recipe, adjust the servings above. Can sunflower butter be used in place of peanut butter? Hi Tracey. We haven’t tried it but I’m sure it would work 🙂 Let us know how it goes if you try it. Is one serving considered one cookie? You are correct, one serve is one cookie. I baked them for 15min and ended up taking them out to cool as I was scared they would get dry and sandy. They’re still very soft though even though they’ve now cooled. Should I have just kept baking them until they actually started firming up? I normally bake them until the edges feel firm, which is 12 minutes in my oven. It may be that your oven is cooler than mine, I would suggest baking them until the edges feel firm before taking them out. Second question, can I substitute Erythritol (same amount) in place of the Xylitol? I have animals and after reading on the Xylitol, I would rather not chance having it in my house. Thank you for all the wonderful recipes. The teaspoon of vanilla is correct. You can definitely substitute erythritol for xylitol 1:1. For this recipe you will need a granulated sweetener as it adds bulk to the cookies, if you have granulated stevia then that’s perfect. As for grass fed butter, it is not essential to a keto diet and regular butter is fine. Essentially you are looking for products that haven’t been overly processed. The less ingredients, the better.